Not everyone you see taking photos of their food before eating it may be doing it for Instagram likes. Some may be pre-diabetic patients from Ng Teng Fong General Hospital checking how healthy their meals are. The hospital has teamed up with artificial intelligence (AI) experts from the National University of Singapore (NUS) to develop a new application for people diagnosed with pre-diabetes, a condition where blood glucose levels are higher than normal, but not high enough to be classified as diabetes. 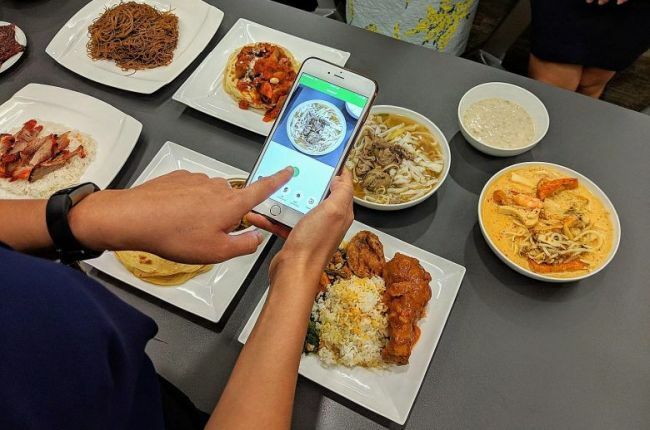 The JurongHealth Food Log (JHFoodLg) app uses AI to match photos of food to a database of more than 200 common local dishes - including nasi padang, laksa and char siew rice - and utilises nutrition data from the Health Promotion Board, JurongHealth Campus and the Australian Food and Nutrient Database. Professor Ooi Beng Chin, from the school of computing at NUS, said: "The system learns dynamically whenever a new photo is uploaded, so it will get even better at recognising the food over time." The app also allows users who are part of the hospital's Lifestyle Intervention (Liven) programme to set weight loss and exercise goals. Figures from 2017 show that more than 400,000 Singaporeans have diabetes, while another 430,000 have pre-diabetes and are at risk of developing diabetes. The hospital's principal dietitian Jesslyn Chong said patients with pre-diabetes can reverse it by losing 5 to 7 per cent of their body weight. Results from a six-month study have been promising. Almost all of the 20 patients who used the app, while taking part in the Liven programme, lost between 4 and 5 per cent of their initial body weight. Many were overweight or borderline overweight before enrolling in the programme. "Our programme helps our participants set realistic health goals such as losing half a kilogram of weight per week. The app also helps to remind them of their goals and motivate them," said Ms Chong. During the study, dietitians and physiotherapists at the hospital monitored the patients' progress and gave them weekly feedback via scheduled live chat sessions in the app. The app's developers say users can track their meals through a "food diary" which records nutrition information like calories, fat, carbohydrates and sugar content. They can also manually adjust the recorded portion sizes if they have eaten more or less than a standard serving. The total daily calories consumed and burned are displayed on the app's dashboard. Exercise activity data from fitness trackers can also be synchronised with the app. Besides sharing their progress with their healthcare providers, users can also share photos on the app's community page, which is modelled after Instagram. The app is currently available only to participants in the Liven programme, but the hospital plans to release it to the general public. However, only patients in the Liven programme will have access to the health coaching provided by the hospital's dietitians and physiotherapists. The public will be able to use the food diary and fitness tracking features when the app is made available. Meanwhile, the study group will be expanded to a total of 140 participants, said the hospital's director of allied health and community operations Lee Hee Hoon. The research programme is expected to be completed in about six months. Ms Lee said: "We believe that everyone can benefit from this app for self-monitoring, not just people with pre-diabetes. "Other chronic diseases can also be controlled primarily through lifestyle and behavioural changes. "The user's personal values and sense of purpose have to anchor and sustain those changes."